The most popular and well known use for Lobelia is in opening the bronchial tubes and clearing mucous from the lungs. It is probably the best herb on the planet for this purpose. Depending on the severity of the case it can take from just a few hours to a few weeks (in chronic cases) to provide relief. It also has a wonderful expectorant action, stimulating the expulsion of obstructive mucous from the lungs and airways. In almost all breathing problems, the main issue is the contracting of the smooth muscle that lines the airways, so causing narrowing. Lobelia relaxes these muscles, so widening the airways. 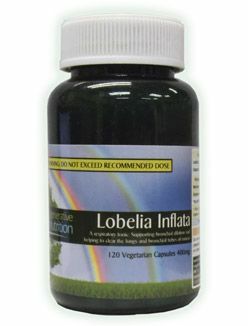 This action makes Lobelia the number one herb for asthma, bronchitis and other breathing problems. It is usually best mixed with liquorice and can be found with an equal measure of Liquorice in the outstanding Breathe EZ product. Lobelia is the most relaxing of all herbs and is one of the most important herbs used in many medicinal herbal systems. Lobelia was used widely by the american Indians and eventually adopted into the European herbal systems imported with the early settlers to that continent. When the circulation exhibits a markedly slow pulse-wave it will be better corrected by lobelia than by any other drug we possess. In fact the most prominent indication for the drug is the full, oppressed, sluggish, doughy pulse. Associate this with thoracic pain, difficult breathing, soreness or bruised feeling within the chest, nausea with tongue heavily coated at base, fullness of tissue, and we have before us a fair range of the action of lobelia. It is a good remedy in cardiac congestion. Acute pneumonia, with, tendency to congestion, the breathing being oppressed, is quickly relieved by lobelia. All chronic forms of sore throat, especially when ulcerated, are benefited by it. Chronic pneumonia, bronchitis, and laryngitis are all conditions in which lobelia will be of great service. In asthenic laryngitis of children it is exceedingly useful. It is a remedy of great value in chronic catarrh, dry, hard, or barking coughs, colds, and all forms of irritation and oppression of the respiratory tract. Lobelia dilates blood vessels, decreases blood pressure and heart rate and makes muscles relax. These actions make lobelia one of the best antispasmodic and relaxing herbs in the plant kingdom. For starters, lobelia eases muscle tension and increases blood and lymph flow. This can be very helpful for easing any kind of cramping pain, including muscle cramps, menstrual cramps, intestinal gripe (cramping pains in the digestive tract) and constricted breathing. Lobelia can also relieve the cramping of the bowel. Another benefit of lobelia is that it promotes lymphatic drainage. It combines well with mullein, cleavers and red clover for this purpose. By promoting better lymph drainage, lobelia can reduce swelling in lymph nodes, ease congestion, clear abscesses and help ease mumps and tonsillitis. Chronic lymphatic congestion is a common problem especially for cold constitutions/low metabolism where the "on rising" temperature is below 36 C or 98 F and can play its part in skin disorders such as eczema, psoriasis and dermatitis. It has a very important action in helping to clear congested lymph. There is information "out there" that Lobelia is toxic, and indeed it should not be taken in excessive doses or it will act as a nauseant. However, no one has ever died from taking lobelia. Herbalists have safely and confidently employed this remedy with newborn infants, weak and sickly people and the elderly for over 200 years. The assertion that lobelia is toxic probably comes from research done on lobeline, but because excessive lobelia induces vomiting it would be nearly impossible to administer enough lobelia to cause a toxic reaction. According to the British Pharmaceutical Codex, 50-200 milligrams of dried herb three times a day is the recommended dose for asthma, chronic bronchitis, and spastic colon. The medical qualities of this invaluable herb are so multifarious that a large treatise might well be written on its curative powers. Suffice it, however, to say that it is a general corrector of the whole system, innocent in its nature, and moving with the general spirits. In healthy systems it will be silent and harmless. It is fully as well calculated to remove the cause of disease as food is to remove hunger; and it clears away all obstructions in the circulation regardless of the nature of the disease.